When the Bushey First World War Exhibition, ‘ A Village Remembers’, was over in August 2014, Roger and I went on holiday to the Lake District. We stayed in a small guest house in Borrowdale at the foot of the Honister Pass, seven miles south of Keswick. Seatoller House, originally a small farm house, is over 300 years old and has been a guest house for more than 100 years. Its long tradition of warm hospitality and a friendly, informal atmosphere make it popular with walkers, artists, and those who want immediate access to the fells. Seatoller House has visitors’ books dating back to 1900, which record the names of participants in the Man Hunts, created by a Cambridge undergraduate, G M Trevelyan, in 1898. Inspired by the great man hunt in Robert Louis Stevenson’s ‘Kidnapped’, this is a game of hare and hounds played out in the fells above Seatoller. On each of the three days of hunting, several members of the hunt, the ‘hares’, leave the house at 8 am, carrying scarlet sashes and hunting horns. The remainder of the party, the ‘hounds’, leave half an hour later. ‘Tally- ho!’ rings across the fells and the ‘hounds’ are expected to make full use of their hunting horns to attract attention and can be caught by touching. In 1901 the Hunt split in two – one organised from Trinity College, Cambridge, the other by C P Trevelyan. With a break for the two world wars, both Hunts continue from Seatoller House today. ‘Returned after an absence of more than 20 years to find the same unostentatious comfort and the same hospitable care, the same beauty of hill and valley, of rivulet and lake. The European capitals are seething with the violence of men’s passions; by the Danube the roar of Austrian artillery has already been heard – and the dark, silent fells around us remain in imperturbable calm’. In 1914 Antwerp was ringed by Belgian forts and after the German invasion of Belgium in August that year, German troops besieged the city. Leo and Anna Burley’s house and all its contents were destroyed during the bombardment. They decided to make their home in England and never returned to Antwerp. During the war Leo served as a Special Constable and they both worked for Quaker Charities to relieve the sufferings of war victims. Leo died in Finchley in 1921 at the age of 48. During his life he had enjoyed many walking tours with his wife in the Black Forest, in Switzerland and in the Lake District, perhaps his favourite haunt. A few visitors stayed at Seatoller House during the First World War and as I turned the pages of the visitors’ book to July 1915, I spotted two signatures from Bushey. 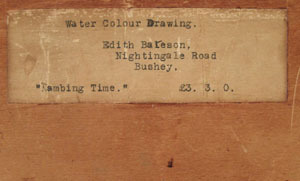 Ancestry.com revealed that Edith Bateson and Anna Gayton were both artists and, as I later discovered, were on Bushey Museum’s list of Artists and Students resident in Bushey in 1915. Edith Bateson, born in 1867, was the youngest daughter of William H Bateson, the Master of St John’s College, Cambridge. From 1891 she studied at the Royal Academy Schools, where she won three silver medals for sculpture. She was one of a group of women artists encouraged to take up sculpture at a time when modelling was done in clay before being cast in bronze. Prior to this, sculpture had been thought too physically demanding for women. One of Edith Bateson’s statues now stands in the library of Lady Margaret Hall at Oxford University. Later, she moved on to painting and by the time she came to Bushey in 1915, she was established as a professional artist at Robin Hood’s Bay in Yorkshire, part of the Fylingdale group. She exhibited four times at the Royal Academy, at many provincial galleries and at the International Society of Sculptors. 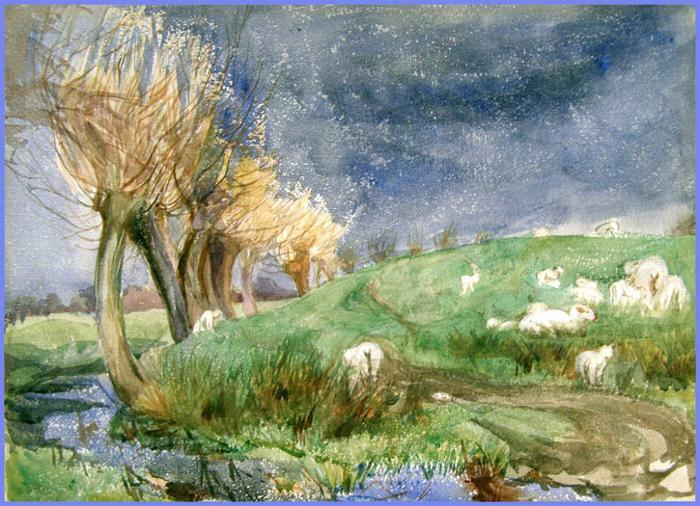 Her vibrant watercolour, ‘Lambing Time’, was painted while she was living in Nightingale Road, Bushey in 1918. 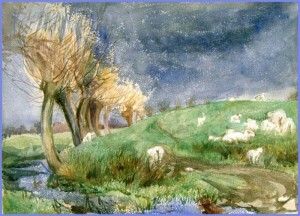 It depicts the onset of an English Spring, with lambs and newly shooting willows under a blustery sky. The ‘modern’ feel and positive atmosphere perhaps accords with the imminent ending of the First World War. While in Bushey, Edith Bateson became part of the artistic colony and befriended Winifred, the younger sister of the artist, Kate Cowderoy, who lived at The Retreat, 5 Hillside Road. In 1919 Edith exhibited a sculpture of Winifred Cowderoy at the Autumn Exhibition of the International Society of Sculptors, Painters and Gravers in London. Anna Maria Gayton, about six year older than Edith, also studied at the Royal Academy Schools, where she too won prizes for sculpture in 1888 and 1890. The youngest daughter of a solicitor, she lived in Much Hadham in Hertfordshire and the 1901 census shows Edith living with her there. Anna later acted as housekeeper for her older brother, a doctor and surgeon, who was Medical Superintendent of Surrey County Asylum. Entries in the visitors’ book at Seatoller House produced some fascinating stories. As Roger and I signed our names, I mentioned Edith Bateson and Anna Gayton from the unique artists’ colony who stayed there in 1915 and added a link to Bushey Museum and Art Gallery.